How do I mark a transaction as a 1099 expense? A 1099 expense is an amount you pay to someone who works for you as a contractor. If they make more than $600, then you’ll need to send them a Form 1099 at tax time. 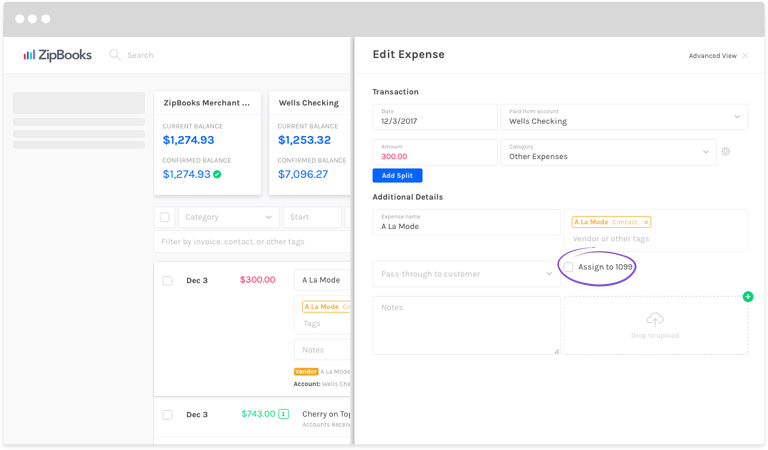 ZipBooks makes it easy to keep track of these expenses. Find the transaction you’re looking for in the list, or add a new transaction. If It’s an existing transaction, click on it, and then click the Edit or Split button. In the Edit Expense window, check the box marked Assign to 1099. Now you’ll be able to see which expenses have been marked for 1099, right from the transactions list.